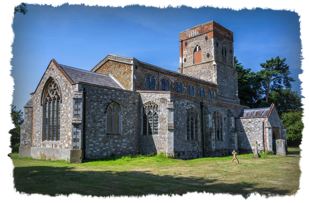 S t Mary’s is the Parish Church in Erwarton, one of the four villages making up the Shoreline Benefice on the tip of the Shotley Peninsula. The church is always open during the day and you are very welcome to come in and look around or to sit and pray and find some peace and quiet. St Mary’s has had some well know visitors in the past, doing exactly that. When Anne Boleyn was in need of some breathing space whilst married to Henry VIII, she used to come to Erwarton Hall and to our church. Legend has it that after her death her heart was buried in the crypt under the organ in Erwarton Church. St Mary’s can be found at the Shotley end of Erwarton on the Main Road. Our postcode is IP9 1LJ. Our churchwarden is Mrs Pat Jackson (787141). All services in St Mary’s start at 11.00 am. Since the Reformation St Mary’s has used the Book of Common Prayer for their services. We celebrate communion on each second and third Sunday of the month. On the first Sunday we have a sung Matins in the Winter and often a sung Evensong in the Summer. On the fourth Sunday we have introduced a family service using contemporary language. We have all enjoyed this a bit more informal service each month. 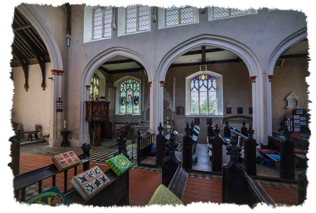 The service rota tells you where the benefice service on the fifth Sunday of the month takes place and informs you of any changes in our regular service pattern. We have a loop system to help people with hearing aids and large print orders of service for the family service are available for those who prefer them. For information about baptisms and weddings in St Mary’s please check the pages on this website or contact the Rector for more information. Wendy is the driving power behind the very popular Soup Lunch in Shotley Village Hall every 2nd Wednesday of the month from 12 noon till 1.30 pm. No need to book, just come along. All are made very welcome. We organise a number of events both because we enjoy them and to raise funds for our church. 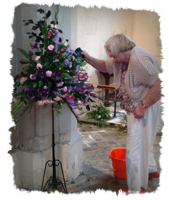 We are known for our annual “Spud Bash” and Christmas Tree or Christmas Wreath Festival and always look forward to our annual Flower Festival. The views from our Churchyard, especially on a sunny day are absolutely stunning.